In production plants that process dusty bulk products, it is necessary to take measures in and around the factory in order to reduce dust emissions to a minimum, writes Harm Klein, project manager at Tebodin. Emissions is a nuisance to the environment, they are bad for health and result in a loss of product. Furthermore, they can lead to dust explosions. With regard to this problem, one can distinguish between emissions in the factory and beyond the factory. In the factory they lead to negative consequences for the operators, the working environment and the effort to keep the factory clean. Dust emissions outside the factory harm the environment and hinder the surrounding factories or residential areas. A lot of equipment is available to reduce dust emissions, and this equipment can be applied in many ways. The application of this equipment generally results in high investments. These can be significantly limited if the equipment and systems are applied effectively. Keywords to do this are: keep it simple and catch the dust as close to the source of the emissions as possible. In other words: if the substance is already absorbed by the ambient air, then it becomes extremely complex and costly to catch the dust and to trace it back to its source. 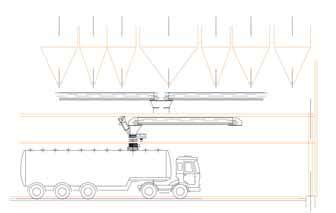 In this article three situations where dust emission can take place will be described: during the unloading of the truck, in the conveying system and above the loading of a truck. Of course emissions can take place in many other situations, each with its own specific circumstances. The right equipment also depends on the requirements that have been made by the authorities. The dust collection will usually be done with a cyclone or a dust filter. In some areas cyclones will be sufficient, however in many cases dust filters are necessary because the dust residue should not exceed the level of 5mg/m3 cleaned air. The design of the truck intake depends on the type of truck: rear unloader, side unloader or under unloader. By catching the dust just after the raw materials have left the truck, the dust can be collected in a simple way, sucked by the fan and filtered by the filter hoses in the same room where the truck is unloading. By creating a direct airflow, a minimum of dust will escape and stay in the room. Often it is necessary to close the door at one or at two sides of the room. Because high speed closing doors are available, the time for the truck unloading can stay short. After cleaning the filter hoses, the collected dust will return to the product without the need for dust conveyors etc. In contrast to complex central aspiration systems nowadays ‘compact filters’ are more effective, simple and economical. If one or a few compact filters are installed in a routing with several conveyors, there is a vacuum inside the equipment and the dust will not leave the equipment. The compact filter is a package, complete with filter, fan, silencer etc. The aspirated dust on the filters will return to the product flow; it is important to select the right compact filter and to choose the right position. The type of the trucks plays a role in the design of the dust collecting system as well. Often open trucks and closed trucks will be loaded successively. Because local situations will vary, the execution should be specifically. Sometimes it is necessary to close one or two doors as well. In existing situations the available height under the loading point is often restricted, however often solutions are available in this kind of situations without having to improve entire existing loading systems. With regard to the application of dust reduction systems, it is important that the knowledge and experience of the available equipment and systems in the suppliers’ market is well known. Generally the situation on the spot is unique with its own starting point in respect to product, situation and application. Tebodin is capable of designing the right solution for each situation. This has already been proven in many projects. Tebodin has lots of experience with addressing substance problems and finding effective dust prevention solutions. The vendor choice for the solutions plays no role, because in this respect there aren’t any commercial interests for Tebodin. Tebodin is a multidisciplinary consultancy and engineering firm. It offers its clients worldwide the knowledge and experience of approximately 4,900 experts in industry, health & nutrition, oil & gas, chemicals, infrastructure, property and energy & environment. The company has a network of around 50 offices inWest,Central and Eastern Europe,the Middle East,Asia and Africa. Tebodin is part of the international engineering and services company Bilfinger SE.